It’s not often that women are cheered in Afghanistan, but when Masooma Hassani’s name is announced, she draws a roar from the crowd. Hassani has taken the top prize in the skiing championship held in Bamiyan province for the second straight year. In an uncertain country, such consistency is an achievement. Spectators braved icy winds, some journeying as far as 35 kilometers to stand in packed crowds for the event. For an outsider like me, it was surprising to see dozens of women show up to watch the competition. Many held their children as they hiked two kilometers to watch the skiers from a nearby mountain. In all, eight women competed in the event. It’s another sign of the growing assertiveness of female voices in this largely traditional society. “It feels so good to be cheered by local people. They recognize you and clap for you. It’s so encouraging,” Hassani says. She hopes to participate in the next Winter Olympics and achieve international recognition. 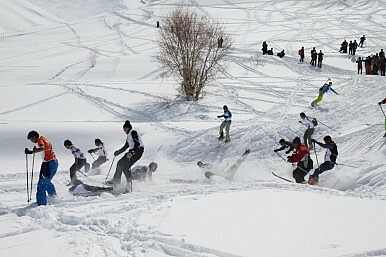 The skiing championship kicked off in 2012, designed to draw tourists to Bamiyan. This year, 24 male and female skiers showed up to ski the mountains of the Hindu Kush. Henriette Bjørge came from Norway to volunteer at the event, teaching girls to ski. Bjørge says she learned a lot about the region and its people during the trip. “It is an eye opener to interact with young Afghan girls,” Bjørge notes. “This is my second trip to the country. When I started reaching out to the girls I was quite apprehensive about the reactions of the parents and local people. But the response really surprised me. Now, there’s so much that I can’t accommodate all the girls. It’s amazing to see the support of the parents.” The Norwegian trainer is receiving the support of the Agha Khan Foundation for her trip. What motivates these girls to ski? “We want to show the world that Bamiyan is another face of Afghanistan, which is not violent, but beautiful,” Sajida, another participant in the skiing championship, told me. A day before the women’s championship, the men hit the slopes near Bamiyan, at Chap Dara village. A total of 34 skiers, including 14 foreigners, mostly from Europe, participated in the event. The winner was a local boy, Ali Shah. The 29-year-old skier has long been familiar with the mountainsides of Bamiyan, where he spent his childhood herding goats. Unlike European skiing resorts, there are no mechanized lifts bring skiers up the mountain. Participants at Bamiyan have to climb at least 2,000 meters through thick layers of snow to get to the starting point. Shah started his skiing journey with homemade wooden skis, but as more and more foreigners started frequenting the area, he upgraded his equipment. His skills drew the attention of the international skiers, who invited him to Switzerland for training last year. That experience made Shah more mature. His victory at Bamiyan is further proof of his talent. Security is undoubtedly an issue. It’s tough to reach Bamiyan. Very few foreigners dare to come by road. The journey from Kabul requires passage through villages infested with insurgents; even local Afghans avoid taking the road. In the winter, the biweekly commercial flight from Kabul shuts down, leaving Bamiyan cut off from the rest of the country. UN-operated flights are not universally accessible and run infrequently. The pristine beauty of this ancient region, once part of the famous Silk Road, remains largely unseen by the outside world. Next year, Bamiyan will be declared the cultural capital of the South Asian Association of Regional Cooperation (SAARC), a grouping of eight South Asian countries. Locals hope that this will improve connectivity in the region and bring Bamiyan into international focus. But the zeal and urge of the skiing participants shows that Afghans yearn to break free of the past and chart a new future for themselves. Afghanistan’s young people are restless, eager to write a new narrative for their hapless country. Masooma Hassani and Ali Shah are byproducts of this new urge.